As mobile and digital platforms continue to explode, one set of differences news organizations and advertisers will be interested in are the news habits of those who choose one device over another and those who get news on multiple mobile devices. Already, the data show some clear distinctions. In addition to spending more total time with news, dual-device news users are more drawn to using apps for news on their tablet. Fully 58% of those who get news on both a tablet and smartphone have news apps on their tablet, compared with 37% who just get news on the tablet. 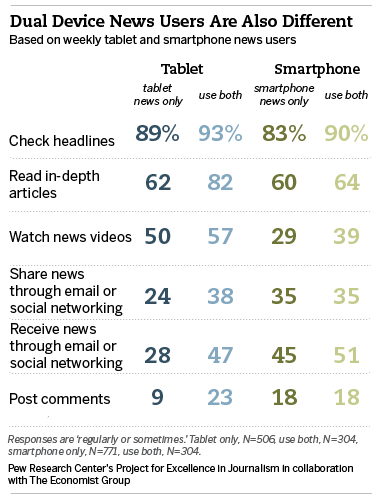 And, more than a quarter, 27%, mostly get news through apps, versus 18% who just get news on the tablet. Conversely, 54% mainly use the browser, compared with 66% of tablet-only news users. On the smartphone, these differences don’t come through as about half of each group (those who just use the smartphone and those who use both), have news apps and a majority of each get news mostly through the browser. Dual-device news users are also more active news consumers on each of their devices than are those who just use one device. On the tablet, nearly all in both groups read headlines regularly, but dual-device news users are more likely to follow those headlines and read full articles (76% of dual-device news users who check headlines do so at least a fair amount of the time versus 60% of tablet-only news users). Those who get news on both mobile devices are also more likely to at least sometimes read in-depth articles on their tablet (82% versus 62%). Dual-device users are more likely to read past issues of magazines on their tablet, 35% versus 19% of tablet own mobile news users. Using the tablet for social networking is also much greater among dual-device news users. They are more likely to get news through email or social networking (47% versus 28%) and to share news that way (38% versus 24%). And nearly a quarter, 23%, regularly or sometimes post comments to news articles versus just 9% of tablet-only news users. On the phone, the only difference that stands out is greater video news watching among dual-device news users (39% versus 29% of those who just get news on a smartphone). Perhaps the difference that stands out most is willingness to pay. Dual-device users are more likely than tablet-only news users to have paid for news on the tablet (though still only 9% of dual device news users have paid, compared with 2% of tablet only news users). In addition, those who get news on both mobile devices are more likely to have a news subscription of any kind – print or digital. About half, 51%, have a news subscription, compared with 38% of tablet only news users and 36% of smartphone only news users. Those who get news on a tablet and smartphone are more likely to have print and digital news subscriptions. What’s more, these dual mobile device news users are considering giving up their print subscriptions at a far higher rate, 38%, than those who just use one of the mobile devices but also have a print subscription (20% tablet only news users; 17% smartphone only news users). PEJ has documented in the past that as people expand their mobile news landscape, they are not abandoning older platforms. The data in this new survey confirm those findings and add greater insight into the appeal of these cross-device and cross platform news users to both news organizations and those that advertise with them. Close to half, 45%, of mobile news consumers (those who gets news on a tablet, smartphone or both) get news on a desktop/laptop daily and 75% do so at least weekly. Print is not nearly as popular, with 45% getting news from print publications weekly and just 18% doing so daily (25% never do). When asked about the platform they prefer most for different kinds of news consumption, a fondness for these older forms comes through. A majority (56%) of digital news consumers who also get news on the laptop/desktop but not in print prefer the desktop most for news. But digital news users who also get news in print are more divided – 38% prefer print and 34% the desktop or laptop with even fewer preferring the tablet (16%) or smartphone (12%). For longer articles, the preference for print among those who get news that way is even stronger; 57% of digital and print news consumers prefer reading in-depth articles in print while just 26% prefer the desktop/laptop computer. And among the digital news consumers who do not get news in print, fully 72% prefer their conventional computer for reading in-depth articles. Mobile news consumers also still turn to their desktop or laptop for their social networking use. More digital news consumers use their computer (58%) most often for sharing and receiving news through social networks than their smartphone (24%) and their tablet (13%).